The word “palatial” is not something you’d normally use to describe an Up North retreat, but it perfectly captures the gracious enormity of Spider Lake Retreat. Located on—you guessed it—Spider Lake, just south of Traverse City, the 20,000 square foot estate provides an ideal escape for extended, multigenerational families and corporate guests. In addition to its ample sleeping quarters, Spider Lake Retreat has a spacious, fully equipped kitchen (for all those hungry mouths), a dining room that seats 64 (yes, 64! 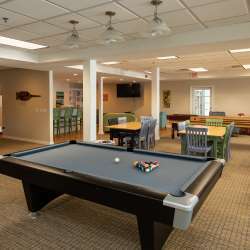 ), a recreation room with a wet bar, a fitness room, and laundry facilities. 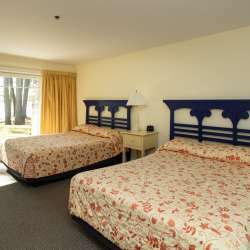 The retreat also has 18 bathrooms, which, come to think of it, makes a lot of sense. The real beauty of Spider Lake Retreat, however, is found out-of-doors. Tucked away on one of the lake’s secluded coves, the property offers guests peaceful privacy and a chance to enjoy this 450-acre, all-sports lake. The retreat has 450 feet of private beach, giving everyone plenty of room to splash, swim, and play to their heart’s content. A private dock and boat launch is perfect for boaters, jet skiers, and the like. After a day of fun and sun, guests can enjoy a barbecue on the expansive, wrap-around deck, while drinking in the waterfront views. When sunset nears, they can strike up a campfire or simply lounge in the beachside Adirondack chairs and take in the show.